Product prices and availability are accurate as of 2019-04-25 17:16:36 EDT and are subject to change. Any price and availability information displayed on http://www.amazon.com/ at the time of purchase will apply to the purchase of this product. Nourish your blueberries and hydrangeas with the Espoma 30 lbs. Organic Soil Acidifier. This all-natural compound is a safer choice than aluminum sulfate and comes in a pelletized version. Add it to your plants and watch as they turn a richer color. Dimensions: 3L x 13W x 19H in.. Designed for organic gardening. All natural, pelletized ingredients. Meant for blueberries and hydrangeas. Capacity of 30 lbs..
Dimensions: 3L x 13W x 19H in. 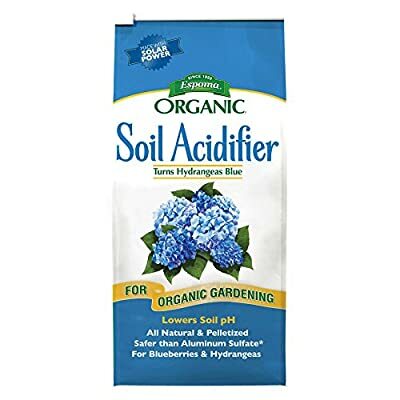 Designed for organic gardening All natural, pelletized ingredients Meant for blueberries and hydrangeas Capacity of 30 lbs.